River Valley senior Nathaniel Abbott competes in the boys high school race as part of the Wellston Cross Country Invitational on Aug. 26 in Wellston, Ohio. PICKERINGTON, Ohio — Once again, for River Valley’s Nathaniel Abbott, it was a matter of a mere three more spots. 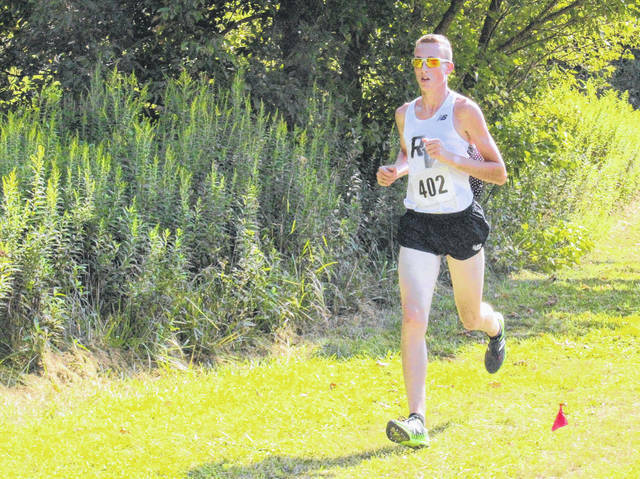 That’s because the senior Abbott, for the second consecutive and final season, ended up three places shy of individually qualifying for the state cross country meet — following Saturday’s Division II boys regional meet at Pickerington North High School. Abbott, competing in his third and final regional, only missed making the coveted state championship by three finishers — as the top seven teams and 28 individuals in the regional advance to the state. Abbott ended up 31st overall in 17 minutes and five seconds, as the final two spots went to a pair of Buckeye Valley runners, which both crossed the line at 16:59. A year ago, when the top 24 individuals automatically moved on, Abbott was 27th in 17:16. Two years ago, like they did on Saturday, the Raiders reached the regional as a Division II team —and almost made it three straight squad appearances after finishing one position shy last fall. This year, River Valley was 21st out of 22 teams with a score of 456, as only Eastern Brown —at 486 —finished behind the Raiders. All of the remaining Raiders ranged from 92nd to 172nd — with their finishing times between 18 and 20 minutes. In addition to Abbott, River Valley’s remaining runners included senior George Rickett (92nd in 18:06), junior Rory Twyman (121st in 18:34), junior Cole Franklin (154th in 19:25), junior Caleb McKnight (163rd in 19:37), senior Kyle Coen (166th in 19:39) and sophomore Austin Livingston (172nd in 19:58). Gallia Academy’s boys were represented by senior twin brothers Kyle Greenlee and Caleb Greenlee, who finished just 13 places and 15 seconds apart. Kyle Greenlee was 43rd in 17:20, while Caleb Greenlee landed a 56th-place finish in 17:35. Last season, both Greenlees ran in the regional as part of the Blue Devils’ qualification as a club, as Caleb crossed in 44th and Kyle finished in 62nd. Both improved their times by 17 seconds this year. Speaking of Buckeye Valley, Zach Kreft defended his overall individual championship, completing the 5K course in 15 minutes and 52 seconds. There were 181 runners in the boys race —and 153 for the girls. Gallia Academy freshman Sarah Watts was the only area female runner, placing 91st in 21 minutes and 44 seconds. Visit www.baumspage.com for a complete list of results of the 2017 Division II regional meet.